Burgess is approached by Brennan who wants her to become involved in the Explorer's Program. Burgess agrees to take Kendra, a teenage girl who wants to be a police officer, on a ride-along. Kendra encourages Burgess to respond to a call with shots fired. When they pull up to the scene, a shot is fired through an apartment window. Burgess responds and tells Kendra to duck and stay in the car. After a shootout with the alleged suspect, Burgess sees Kendra is missing from the car. Eventually, Burgess finds Kendra back at home. She explains she was spooked by the situation and ran into a coffee shop where a woman gave her money to take the bus. Brennan calls Burgess into her office and subtly hints that she lie to the review board about a civilian being in the car. She claims she wants to uphold the image of a "female hero," which is good publicity. Burgess feels uneasy but when she faces the board, she tells them she answered the call alone. Shortly after, the woman from the coffee shop comes to tell Burgess that she saw a young girl who bumped into the suspect. Burgess withholds this information because if she has Kendra testify, it proves that her statement under oath was a lie. She approaches Brennan to find a solution, but Brennan denies any fibbing insinuations. Video surveillance reveals that Kendra ran into the alley where she bumped into Trent Snow, the man that keeps evading justice for robbery, drugs, and murder. Voight learns the truth and asks Platt to help handle the situation. After Kendra testifies and Intelligence gets a warrant against Snow, they arrive at his house where they find his brother badly beaten. They find the stolen car and follow gunshots to a nearby motel. When they get inside, Snow is overdosing. 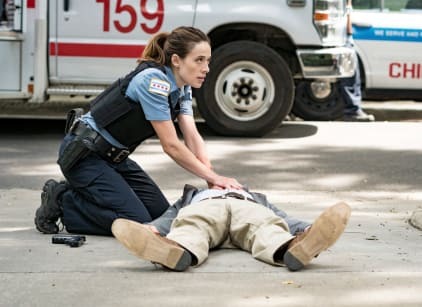 Atwater tells Burgess they can keep it between them and let him die, however, Burgess secures Narcan and saves his life. Realizing that lies only contribute to the problem, she goes to Detective Chen to tell her the truth. When Det. Chen tells her that it's been taken care of, she goes to thank Voight. Voight doesn't take the credit instead threatening Burgess to end her if she ever compromises an investigation again. Platt fesses up to making the call and takes Burgess out for lattes. Meanwhile, Ruzek witnesses Antonio sustain an arm injury which we know he had previously. He questions whether or not to keep it out of the report, but Antonio tells him to always be honest since covering up is often worse than the crime itself. Later, Antonio is seen taking his last hydrocodone pill and calling his doctor (on speed dial) for a refill. Don't run away from a compliment. Gets you nowhere. Permalink: Don't run away from a compliment. Gets you nowhere. Feeding the cat, really? That's what you're doing here? Permalink: Feeding the cat, really? That's what you're doing here?